We have been busy making jerky at the Somerville household. And by “busy” I mean that I made many batches of jerky and my son ate them all while I was at work. 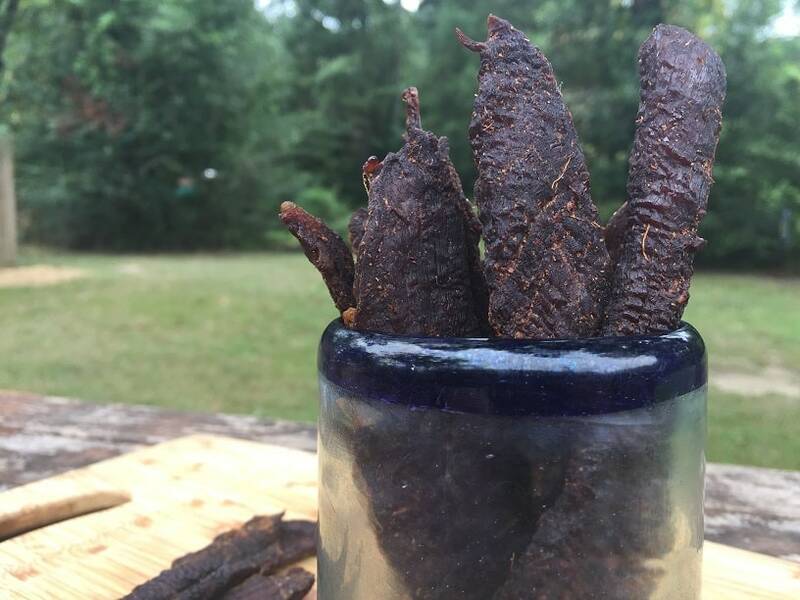 I figured I had better write a post on How to Make Jerky just in case my boy ever decides to make his own. You are going to need to do a bunch of meat slicing if you want to make jerky. Some folks just free hand and eyeball their cuts while others use a deli slicer. I personally think that the best meat slicer for jerky is a reversible jerky board. 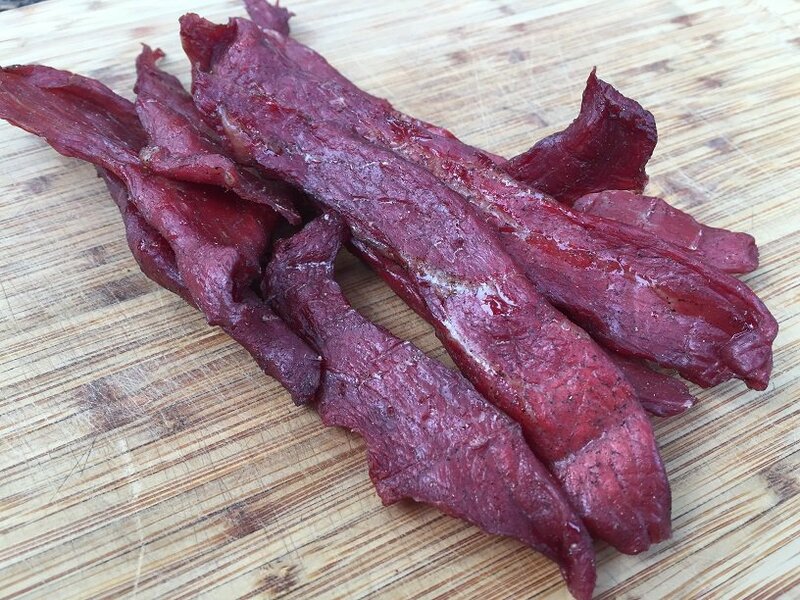 The meat you want to use for jerky is the opposite of what you would use to make sausage. While you want about 25% fat for sausage you want jerky to be as lean as possible. 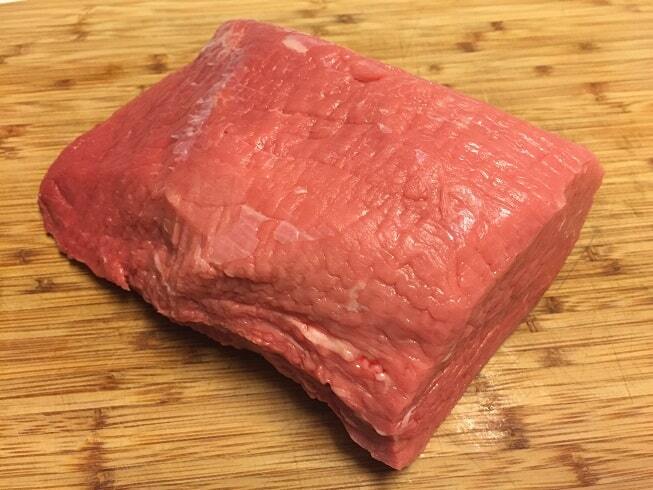 When I make beef jerky I use an eye of round roast that has been trimmed of the fat cap and silver skin. 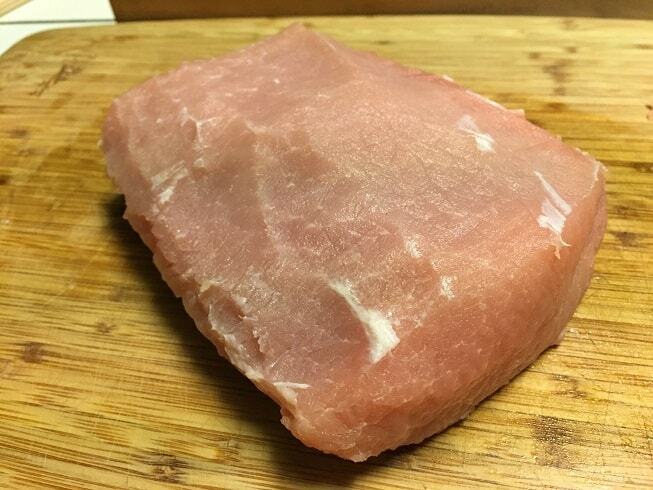 When I make pork jerky I use a pork loin roast that has been trimmed of the fat cap and silver skin. 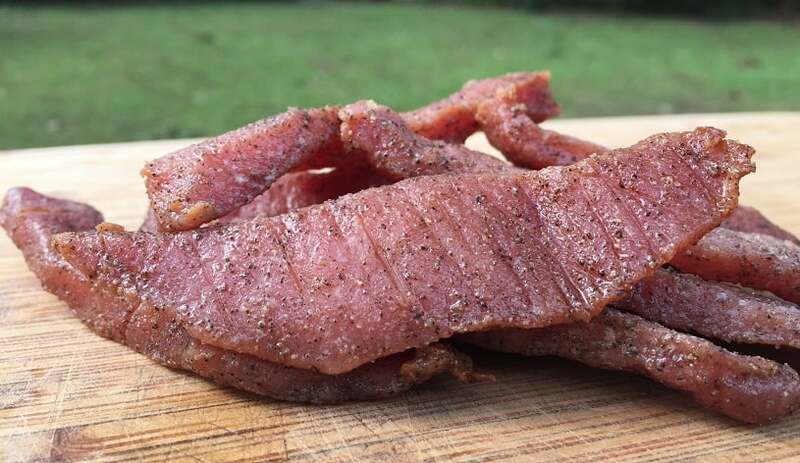 I like a tender jerky so I tend to slice the meat against the grain in either 1/4 or 3/8 inch strips. If you want a little more chew to your jerky then slice with the grain. Try not to slice the meat any thicker than 3/8 of an inch as it will make it harder to properly dry the meat. I use a jerky board to get consistent slices. The jerky board is simple to use, highly effective and cleans up in a snap. After your meat is trimmed and sliced you get to figure out your flavor profiles and how you want to approach food safety. The short version is that the meat will need a combination of High Heat to kill bacteria and Low Heat to dehydrate the meat. The High Heat step is what makes jerky safe to eat. The Low Heat step is what gives jerky its texture and shelf life. Before Dehydration Option: Place the seasoned raw meat into a pre-heated 325F oven for 20 minutes. Remove the meat from the oven and start the dehydration process. After Dehydration Option: Take the dried meat out of the dehydrator and place into a pre-heated 275F oven for 15 minutes. Removal of moisture from the meat is the long term stability of the jerky. If the water content is sufficiently low then mold and bacteria will not want to grow and multiply on your jerky. 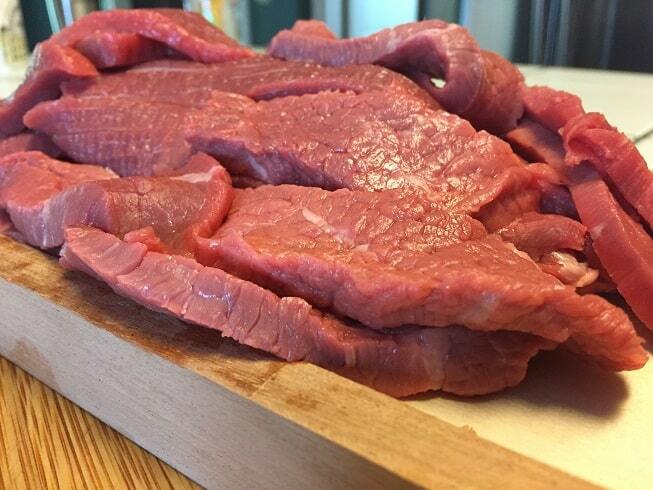 There are two concepts to keep in mind when dehydrating the meat. 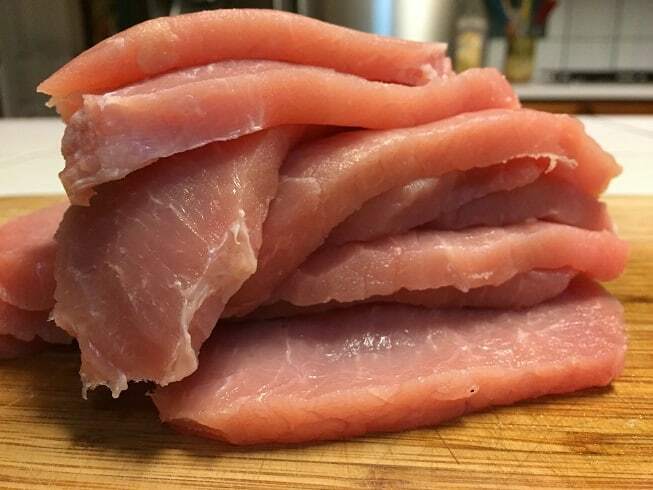 Temperature: If you dehydrate at too high of a temperature you run the risk of creating a hard outer layer that will trap water inside the meat. Ideally you want to use a temperature in the 130-160F range. This is hot enough to force water to evaporate from the meat surface but not hot enough to form a boundary layer. Time: If you remove all of the water the jerky will last forever but be completely inedible. You want the jerky to be dry enough that it doesn’t crack when you bent. It should have a little flex. I store my jerky in the refrigerator. I have teenagers and a batch of jerky NEVER lasts longer than three days. There are many different means that can be used to dehydrate the meat. Use a food dehydrator. There are many nice options available that cost between $50 and $300. 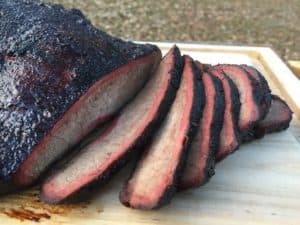 Use an electric smoker. The digital Masterbuilt electric smokers have great temperature control in the 150F range. Use your oven. I set my oven to its lowest setting (170F) and keep the door cracked open with a wooden spoon. I can’t tell you exactly how long it will take you to dehydrate your jerky. It will depend upon how many pounds you are making, what you are using as a dehydrator and your temperature settings. Recipes are made in two pound batches. I pre-cooked the meat in a 325F oven for 20 minutes. I dehydrate the jerky in a 170F oven with the door propped open for 5 hours. Here are four different version of jerky where I mixed and matched different styles. 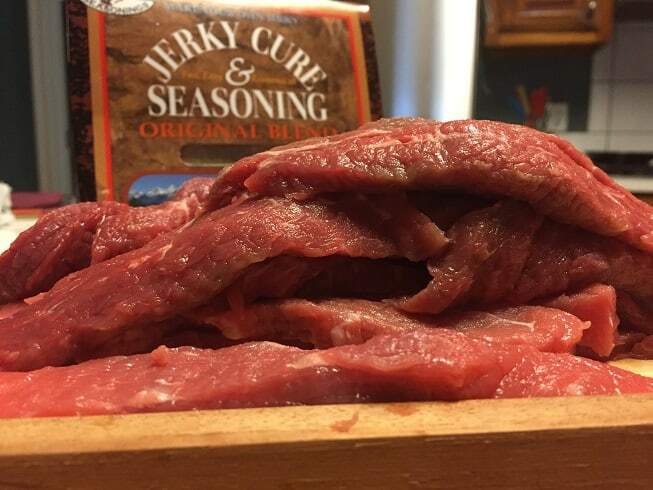 This jerky was prepared using the cure and seasoning blend that came with my Hi Mountain Jerky board. Slice against the grain and cut the loin into strips. I used the jerky board to get consistent 3/8 inch thick slices. Mix the cure and seasoning in a bowl. Add a quarter of the mix to the pork and stir to distribute it as evenly as possible. After the mix has been stirred in add another quarter and repeat the process until all of the cure and seasoning are well distributed throughout the meat. Place the seasoned meat into a clean bowl, cover and let rest in the refrigerator overnight so the cure can penetrate the meat. The next day arrange the meat on a drying rack supported on a sheet pan. You want the meat to be evenly distributed and not touching. Place the meat in a 325F oven for 20 minutes. 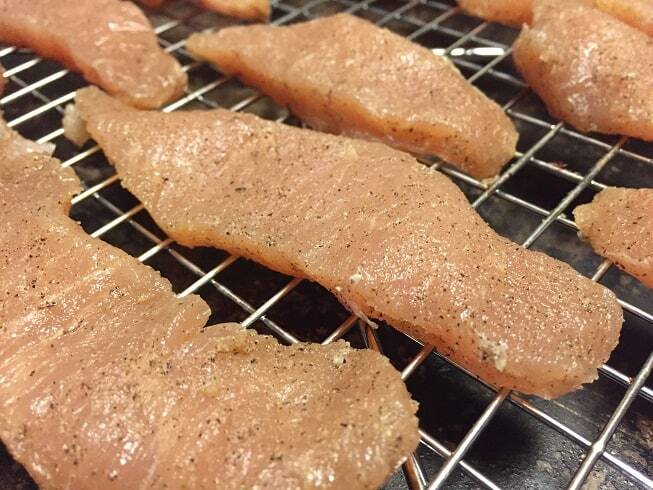 Remove the meat from the oven and dehydrate until the desired texture is achieved. I dehydrated using my oven set at 170F with the door propped open for 5 hours. This followed the exact same process used for the pork jerky except I flipped the jerky board over and cut the beef into 1/4 inch strips. The beef was mixed with the seasoning and cure then allowed to rest in the refrigerator overnight. The next day it was given the high heat treatment and then dehydrated. The cure mix is what gives this jerky its beautiful color. Using a manufacturer’s blends according to their directions will produce a great jerky but I like having control and being able to add flavor variations to my jerky. For this batch I ditched the cure and seasoning packets and went with a jerky marinade with an Asian flair. I sliced up two pounds of beef and let it soak in the marinade overnight. The heat was pretty mild but the ginger really popped in the final product! 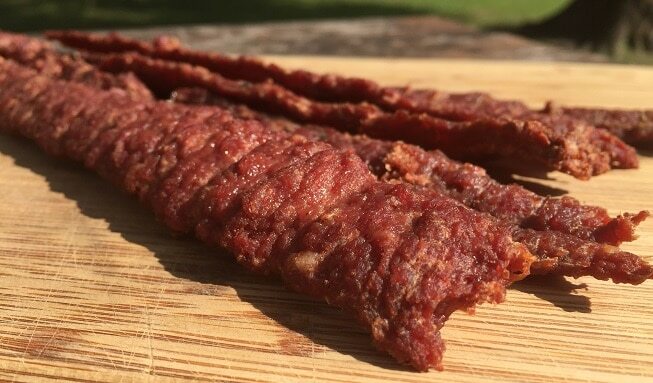 To get the softest textured jerky you need to use ground beef. To make sure the jerky will be safe to eat please only use beef you have freshly ground yourself. 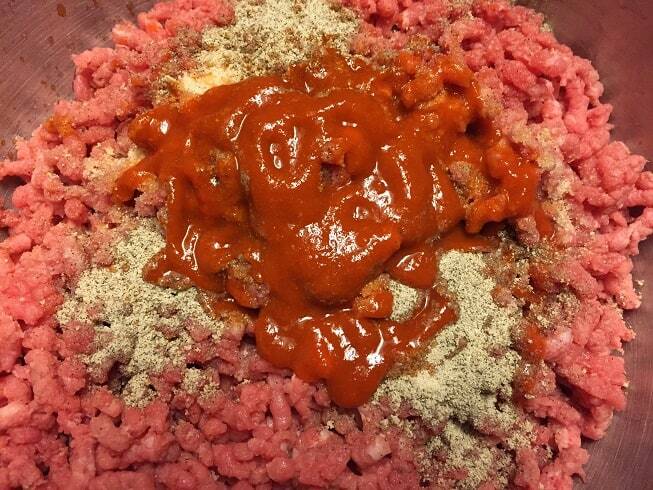 I started with trimmed eye of round cut into strips and fed them through my Kitchen Aid meat grinder. 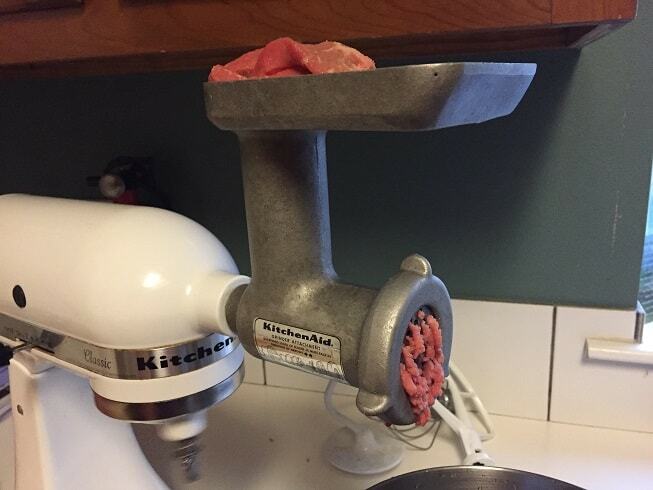 If you don’t have a meat grinder yet then now is the time to get one. Here is my guide to choosing the best meat grinder if you need help picking one out. The beef was mixed with the Hi Mountain cure and seasoning blend along with two tablespoons of Sriracha chili garlic sauce. I added 1/4 cup of ice water to help distribute the seasonings and used the paddle mixture on low sped for three minutes to get everything evenly mixed. The meat was refrigerated overnight. The next day I loaded the meat into a jerky cannon and extruded it into strips. The strips were cooked and dried like all of the other batches of jerky. The extruded jerky was a little more work but was far and away the family favorite. It was tender and beefy was a nice bite of spice at the end. I hope you found this guide on How to Make Jerky useful! I did not see the four recipes. What or where can you find a jerky gun or??? For ground beef jerky or is there a way to get it otherwise?